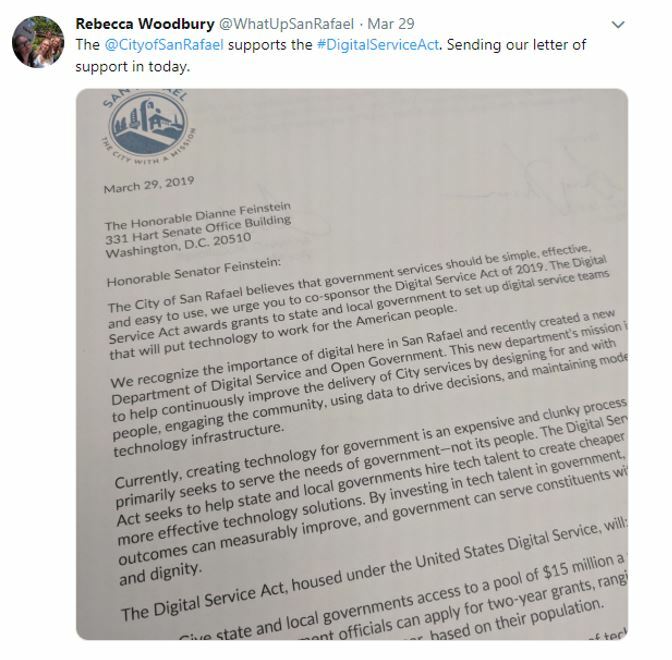 Mayor Philips and Vice Mayor McCullough recently signed a letter to voice our support for the proposed Digital Service Act, proposed by Senator Kamala Harris. The Act would create a pool of $15 million annually in grant funding for state and local governments to hire technology talent and other digital service projects. The bill recognizes that government needs to do a better job attracting and retaining tech talent to help create cheaper and more effective technology solutions. We will continue to monitor this bill and hope to get our hands on some of that money. More information about the Digital Service Act. The citywide Community Engagement Team held their second meeting last week. The group chose two priority projects: multi-lingual outreach methods and a communications inventory. The first team will work on ways we can increase civic engagement with our Latino/a/x population and other communities where English is not the primary language spoken at home. The group also talked about the importance of understanding cultural differences in addition to simply translating text. Each team will work over the next few months on developing a project plan, establishing roles and responsibilities, and report out their progress at our next meeting in June. Our March All-Hands meeting focused mostly on getting feedback on parts of our draft strategic plan. The team split up into small groups and talked about specific projects to address gaps in our technology support, transparency, network, connectivity, and security. Read more for a fuller summary of the meeting and the slide deck. We’re almost ready to share our draft strategic plan and our annual work plan with other departments to get feedback. isn’t. To dig into the rest of the survey results (and prior years), visit: www.cityofsanrafael.org/resident-satisfaction-survey.